Bringing the magic of play to communities. Play is powerful. It instills important values like leadership, perseverance and cooperation in kids. That’s why we design playgrounds that add value to kids’ experiences, and bring individuals of all ages and abilities together for play. Play is everything, and no matter our age, we come back to what we know… Play will always shape us. We are proud to lead the conversation about the power of play with this video, and want to help you lead the conversation in your communities. Request a download of our Video Discussion Guide here. Help us spread the important message heard in this video by sharing it with your family, friends and colleagues on social media. And be sure to tell us how play has shaped your life using #shapedbyplay. Kids play. It’s a simple thing to do. A way to pass the time, let off some steam. To us, play is so much more. It’s a trial run of adulthood. A way for kids to discover and practice all the skills they’ll need in the future. Leadership, persistence, empathy, courage. Play is amazing because it shapes kids for tomorrow. So for a better tomorrow, we play today. You’ll find everything you need to complete your play environment. From new products to featured designs, individual components and fitness equipment, we’ll ensure your playground is everything you imagine and more. 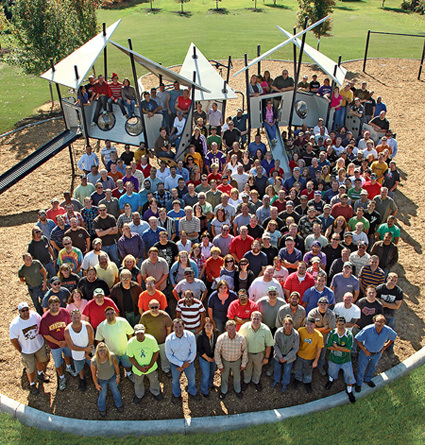 Browse our virtual 2018 Playground Equipment Catalog, then request a copy. Give kids and families much-needed heat and sun protection while visiting any play, rest or activity area. However much shade you’re looking for, SkyWays® shade products have you covered. Browse our virtual publication, then request a copy of the 2018 SkyWays Shade Products Catalog. Invite individuals of all ages and abilities to immerse themselves in the brilliance of an Aquatix water experience. See how Aquatix moves graceful aqua play experiences well beyond a fun way to cool off. Browse the 2018 Aquatix Catalog, then request a copy. At this special time of year, we’d like to thank you for collaborating with us. Together we’re creating more than just playgrounds. We’re creating opportunities for imagination. Opportunities for children and families to celebrate each other… similarities and differences. Together, we’re helping build the leaders of tomorrow. Thank you for all you do to create the next generation of great citizens. For a better tomorrow, we play today. Play shapes us. It helps build leaders, encourage collaboration, teach persistence, develop problem-solving skills and much more. That’s why we launched the Shaped by Play Scholarship in June. Our goal was to fund activities that help build the leaders of tomorrow. We accepted nominations for the scholarship throughout the summer, and are excited to announce the winners! We were able to award 16 individuals a scholarship to participate in activities ranging from figure skating lessons to invention camp. Stay tuned throughout the next year, as we check in with our Shaped by Play Scholarship recipients to learn about their experiences. Good things start on the playground. That chance moment when kids from anywhere get together just to be kids. To free their spirits, their bodies, their minds. And through play, kids show persistence, leadership, competition, bravery, support, empathy. They show us who they will become as adults. They show us, as adults, who we should be now. Yes, good things start on the playground. And last a lifetime. Browse or request your 2017 Playground Equipment Catalog and find inspiration for your next playground design. And we encourage you to share how you were #shapedbyplay in the comments below or on Facebook, Twitter and Instagram. Our cofounder, Barb King (1946-2008) was recently inducted into the Minnesota Women Business Owners Hall of Fame. The Hall of Fame was created to honor women entrepreneurial leaders and the first of 25—20 living and 5 posthumous—representing 150 years of Minnesota business history were inducted on April 25. Barb was honored for her business innovation, leadership and the legacy she left for future generations of Minnesota business women. 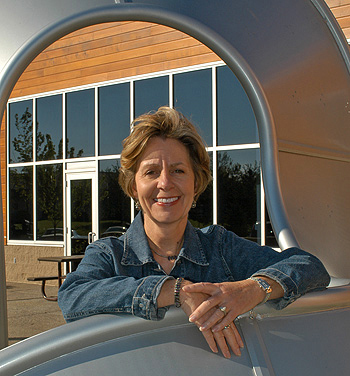 Barb was the president of Landscape Structures until her passing in 2008, and was committed to children throughout her life. She was passionate about showing them how to lead healthier lives and to appreciate nature. In addition to cofounding Landscape Structures with her husband, Steve King, Barb founded and was the benefactor of the Säjai® Foundation. The Foundation is a national nonprofit organization dedicated to working with local communities to educate children about how to live a healthier life by encouraging them to get outdoors, be active and make smart nutrition decisions. All of us employees are proud to have known Barb. She was our passionate colleague, friend, mentor, confidant and much more, and we constantly strive to celebrate her inspiring life. Learn more about Barb here, where you can read past articles written about her, browse photos of her in professional and personal settings, and watch a video to get a sense of who Barb was and see the positive impact she had on so many people.